A constitution is a written document that contains a set of rules for a government and its relationsip with the citizens. 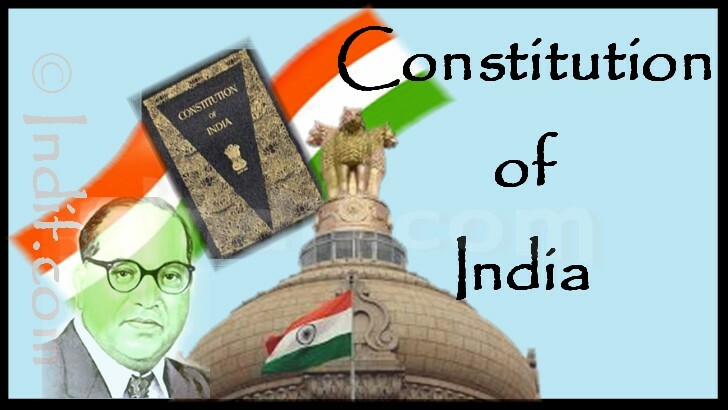 Indian constitution,popularly known by its Hindi Name “Bhartiya Sanvidhan," is a comprehensive document and is the lengthiest written constitution in the world. Dr. Bhimrao Ramji Ambedkar is widely regarded as the architect of the Indian Constitution. India is a Sovereign Socialist Secular Democratic Republic with a parliamentary system of government. The Republic is governed in terms of the Constitution of India which was adopted by the Constituent Assembly on 26th November, 1949 and came into force on 26th January, 1950. The 1949 Constitution, the supreme law of the Federal Democratic Republic of India, proclaimed the independence of India after 90 years of British colonial rule. Adopted by the Constituent Assembly on November 26, 1949, it is fully applicable since January 26, 1950. It consists of a preamble, 22 parts containing 395 articles, and 12 schedules in the Constitution of India. Amendments have been made to the Constitution time and again as per the need of the hour. It lays out the fundamental political principles, establishing the organisation, powers and duties of the legislative, executive, and judicial branches, details the division of power between the Union (central government) and the States (regional governments), and delineate the fundamental rights and duties of citizens of India. As per Article 79 of the Constitution of India, the council of the Parliament of the Union consists of the President and two Houses known as the Council of States (Rajya Sabha) and the House of the People (Lok Sabha). The constitutional head of the Executive of the Union is the President. Preamble refers to the introduction or preface of the Constitution. It contains the summary or essence of the Constitution. It sets out the philosophy on which the political system rests or in other words, it clearly establishes the main objectives on which the Indian constitutional structure was crafted. The basic philosophy of the Constitution, its moving spirit, is to be found in the Preamble. The Preamble itself was based on the Objectives Resolution drafted by Nehru and introduced in the Assembly in its first session on 13 December 1946 and adopted on 22 January 1947. "WE, THE PEOPLE OF INDIA, having solemnly resolved to constitute India into a SOVEREIGN, SOCIALIST, SECULAR, DEMOCRATIC, REPUBLIC and to secure all its citizens." Indian Constitution is 2nd largest Constitution in the world. 1st one is of Ireland. After the independence of India in 1947, it took 2 years 11 months and 18 days to build the Indian constitution. The drafting committee had handwritten and calligraphed the constitution - both in English and in Hindi. There was no typing or print involved.The original copies of the constitution are preserved in a secure way in the Library of the Indian Parliament. The calligraphy in the book was done by Prem Behari Narain Raizda. It was illuminated by Nandalal Bose and other artists. The illustrations represent styles from the different civilizations of the subcontinent, ranging from the prehistoric Mohenjodaro, in the Indus Valley, to the present. 284 members of the Constituent Assembly (which included 15 women) signed the hand-written documents on January 24, 1950 and it came into force on January 26 the same year. The Constitution of India is federal in nature but unitary in spirit. It has been written by taking different articles from constitutions of other countries. The day constitution was signed, it was raining outside. Many considered it as a good omen. Article 19 - Right to freedom of speech and expression. Right to assemble peacefully and without arms. Right to form associations or unions. Right to move freely throughout the territory of India. Article 26 - Freedom to manage religious affairs. Article 45 - Provision for free and compulsory education for children.